Am I near reaching my limit as a free user? I go to email this form and it goes opps reached your limits. The rossmills stats would say otherwise. Do I need to upgrade already? I have checked your form and I am able to see that you are not reaching yet your limits as a free user. However, to prevent any error with regards to your monthly limit. I highly recommend that you upgrade your account if you are expecting a lot of user to come-in and will fill your form. 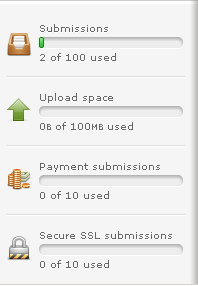 Because as a free user you will only have 100 submission per month, 100mb on the storage, 10 payment and secure submissions only. Here's the detail of the pricing of our subscription. Kindly let us know if you have further questions or inquiry. If it is a new topic, kindly open a new thread to avoid any confusion and to assist you better. If I have not reached my limit, I dont see why I should need to upgrade as I am only trialling the package at this stage. What could be other reason be for this error message please? The error message that you received means that you have reached the limit for the amount of email invitations that you can send out for the hour. Currently there is a limit of 2 per hour. Please try sending out another invitation after the hour has passed and let us know if you are still receiving the error message. Thanks Tasha, that sounds more promising. Will try a little later on.